I’m a big believer that kids come to school prepared to do the best they can. I don’t think anyone wakes up with the intention of having a really bad day. And yet, school days are not always seamless. As an elementary principal I often have the opportunity to meet with students in those moments right after their day has taken a turn for the worse. Perhaps they are not willing to work in class, perhaps they had conflict on the playground, or perhaps they said something unkind to another student. The reasons kids misbehave can vary, yet each situation is an opportunity for everyone to learn. It’s an opportunity for the child to learn from their decisions, and it’s also an opportunity for the adults involved to strengthen their relationship with the child by finding out more about them. As educators we know that punishment doesn’t correct behaviour. We do know that strengthening relationships and teaching kids HOW to behave helps students thrive at school. In my first year at Harry Hooge Elementary, I have struggled at times to find ways to teach behaviour. Some of the skills that work at secondary through conversation are not as effective at elementary. For example, when I asked three five year old boys why we have a no pushing rule, they all put up their hands with excitement. One asked if it was because we have a library, and the second asked if he could share my banana. Um, no. (don’t worry he is a well fed kid). Luckily I work with awesome teachers and education assistants who are also curious how we can be proactive teaching behaviour. At Harry Hooge Elementary, we have decided as a staff that we would like to embark on a journey, learning more about self regulation. To start our journey, we spent the first of two pro-d days travelling to West Vancouver School District to tour two schools excelling with self regulation, West Bay Elementary and Hollyburn Elementary. Principals Judy Duncan and Tara Zielinski offered resources, shared their journey, walked us through classrooms and allowed us to see the impact their work with self regulation has had on their teachers and student learners. Their journeys began with a couple of classroom teachers who were part of a district learning team working with Dr. Stuart Shanker. Shanker, a leader in the self regulation field, suggests that a child’s ability to regulate their behaviour is a better indicator of their success than any IQ measure. When children learn to remain calm, focussed and alert, they increase their ability to learn more complex concepts. Principal of West Bay, Judy Duncan, shared that her school’s journey with self regulation has been the most transformational initiative that she has seen as an educator. Self Regulation is not a program, it is a process. Rather than correcting children who are off task, ask “What do you need?” Often simple solutions like movement, alternate seating, or a water break can help the child gain focus. The environment is the teacher. Neutral colours, soft lighting, comfortable seating and few visual distractions help students focus. Common language with students and staff help everyone become more self aware and aware of others. For example, the Zones or Regulation language helps students and staff identify if they are in the green zone (ideal for learning), blue zone (low states of alertness), yellow zone (triggers at play) or red zone (heightened states of alertness with intense emotion). There is a lot of teaching that goes with implementation. Helping students learn about self regulation and the tools that can help them sets them up for success. Teachers model self regulation skills. Creating a calm environment in hallways and the staff room is a great place to start. Every child has different needs. The goal is for the child to become aware of what works for them and what doesn’t. Change does not need to be expensive. To help children focus, allow simple tools such as headphones, cardboard dividers, quiet corners, dim lighting, access to water and healthy snacks, etc. A simple change is to turn desk tables the opposite direction so students do not use the desks to hold their belongings. Instead, use baskets along the wall where students only bring what they need to a chosen workspace. This allows the students to work in calmer, focussed work areas. What works for one teacher may not work for all. We need to experiment with our teaching space to discover what works for us, just as students need to identify what works for them. Sharing self regulation information with parents, and with next year’s teachers helps students transition and continue with their success. While both schools shared amazing visuals, ideas and best practices, what many of our staff noticed most was ‘the feel’ of the schools. In both instances, the energy of the building seemed calm, positive and learner focussed. 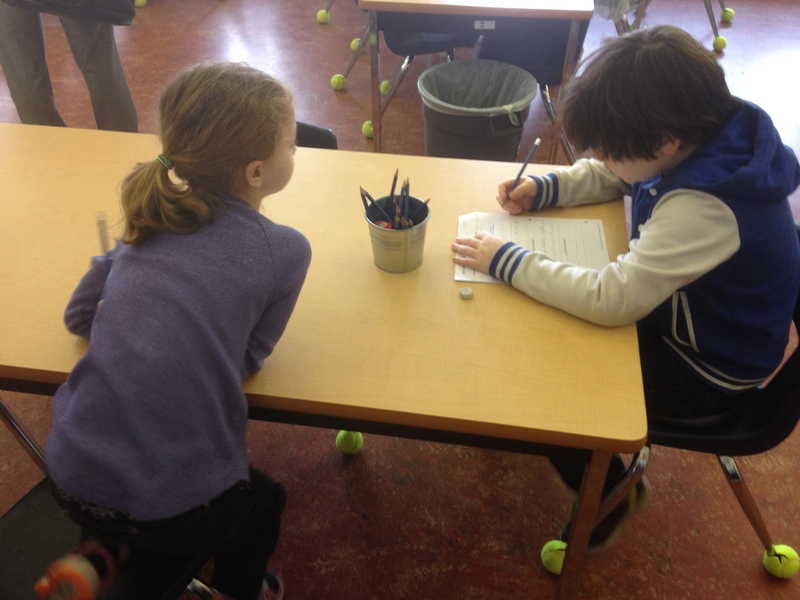 We witnessed students and teachers working together on a journey to create calm, alert learning environments. On our second pro-d day, we met as a staff for our growth planning day. Over the course of the day we identified our strengths, discovered what we want to learn more about, and brainstormed ideas on how to get started. We are beginning with more questions than answers – but that excites me, as we are not pretending to be the experts -instead we are on a learning journey. Within our first week, I am already seeing exciting things happening such as a Kindergarten class learning the Zones or Regulation colours, a grade one class having a class discussion about what they need to be able to learn, and a grade 7 room rearranging furniture and de-cluttering to remove visual noise and create a calmer learning environment. We are beginning a staff book club and plan to meet throughout the year sharing what we are learning with each other, with our students and with our parents. A huge thank you to West Bay Elementary and Hollyburn Elementary. Your mentorship and guidance has inspired us to embark on our Self Regulation Journey! awesome focus for a school!